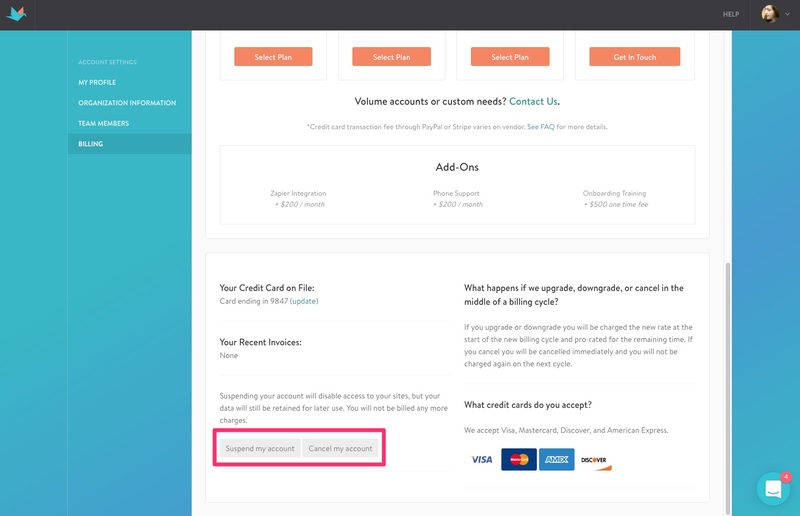 If you're ready to cancel or suspend your account, here's how you can do so from within your CauseVox account. Step 1: Login to your CauseVox admin account. Step 2: From your campaign listing, find the dropdown menu on the upper right corner of the screen and select "Billing." Step 3: Scroll all the way down to the bottom of the Billing page, where you'll find our suspend and cancel buttons and select your desired action. Suspending your account will take your campaigns offline and will restrict access to your data until you upgrade, but all your data is still stored within your CauseVox account. By suspending your account, you will no longer be billed monthly fees until you upgrade. Canceling your account deletes your account with all it's data, and you won't be billed any further fees. We recommend exporting your donation data before canceling your account.